I have to admit that I am not really a sweet person. I mean, I’m nice enough (har har) but I’d rather eat a block of cheese then a block of chocolate. My weakness is pie. I love pie. Maybe my lizard brain thinks since fruit is involved, it must be healthy? I don’t know. But I do. And when I found out my friend Alejandro’s roommate Michael Kelly was involved in Daly Pie with owner Meghan Daly, I was all over it. 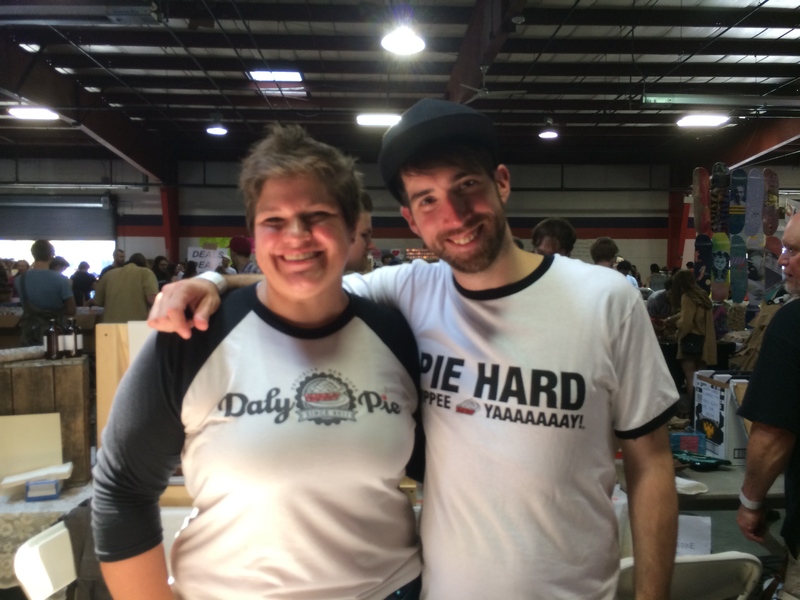 Daly Pie, started in 2011, is the brainchild of Meghan Daly, and Michael Kelly recently joined the party. 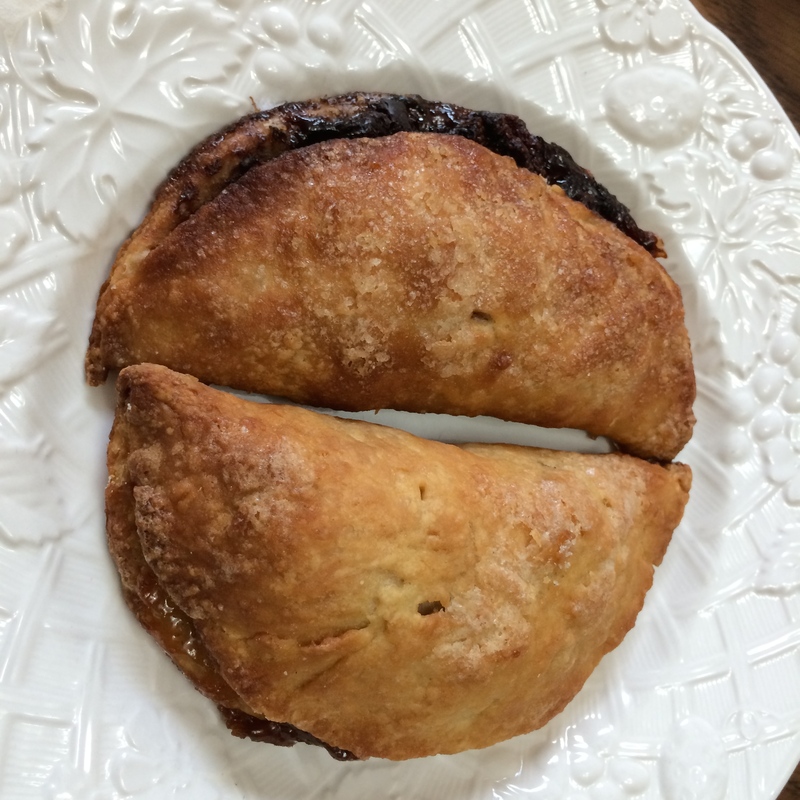 They are based in Brooklyn and crank out tons of amazing pies and the new big thing: hand pies (Pies…that can fit in your hand. Amazing, I know). They sell all over the place, mostly in NYC, from bazaars to food trivia nights to coffee shops and beyond. Also, they sell straight to you! Yes, YOU! I was excited when Michael told me they’d be at the Punk Rock Flea Market, which is a huge, yes, flea market, in Philly. 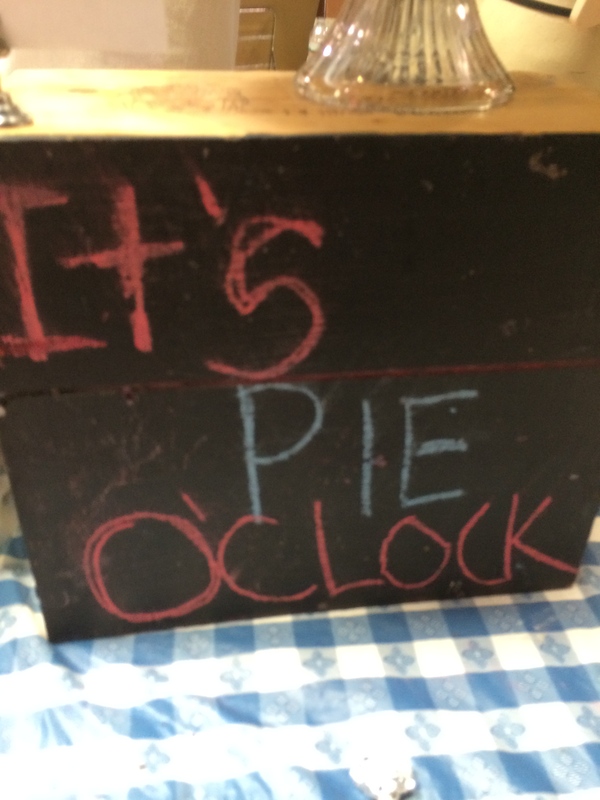 Figuring out which pies to buy was like going grocery shopping before dinner. So, yeah, I just bought one of everything. First off are the hand pies. One apple and one Strawberry Chocolate. I’ve only had one other hand pie, from a place in LA in the Grand Market. It was ok, but most of the filling seeped out so I had more of a strawberry flavored shell with some filling that managed to hang on for dear life. When I saw the Daly hand pies, I was a little bit concerned that this might also be the case. I am delighted to say that no, this was most definitely not the case. These pies were chock full of filling. 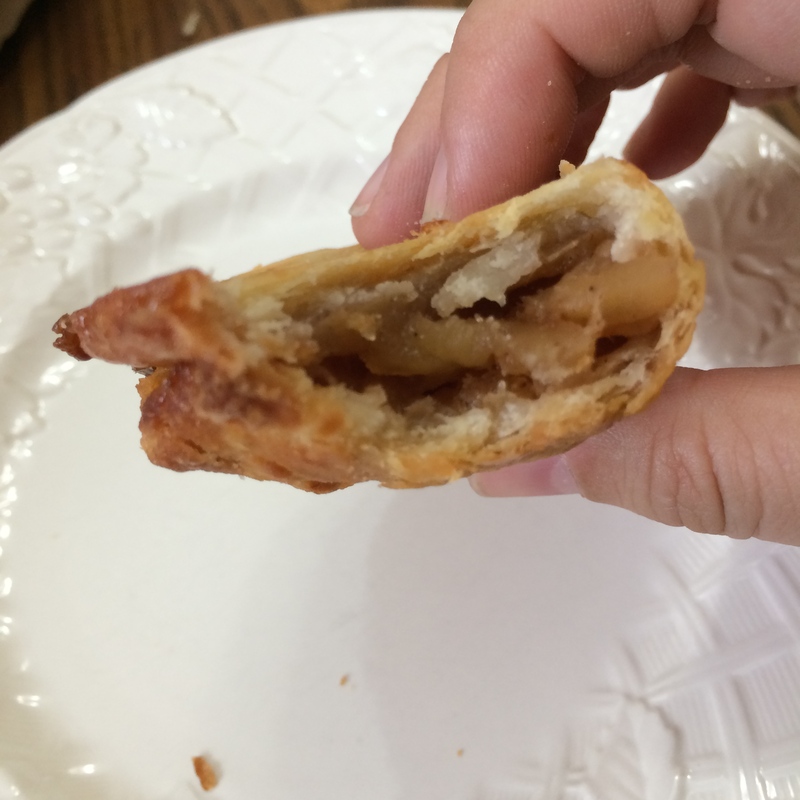 The apple hand pie was stuffed full of delicious apples with a great cinnamin-y spice that was not overpowering, and just enough sugar to bring out the natural taste of the apple. The apples themselves were not a mushy mess, but had a lovely texture with a little bit of give. The Strawberry Chocolate hand pie (of which I didn’t get a good picture of because I was too busy stuffing it in my mouth) was also full of fruit and blueberry goodness. 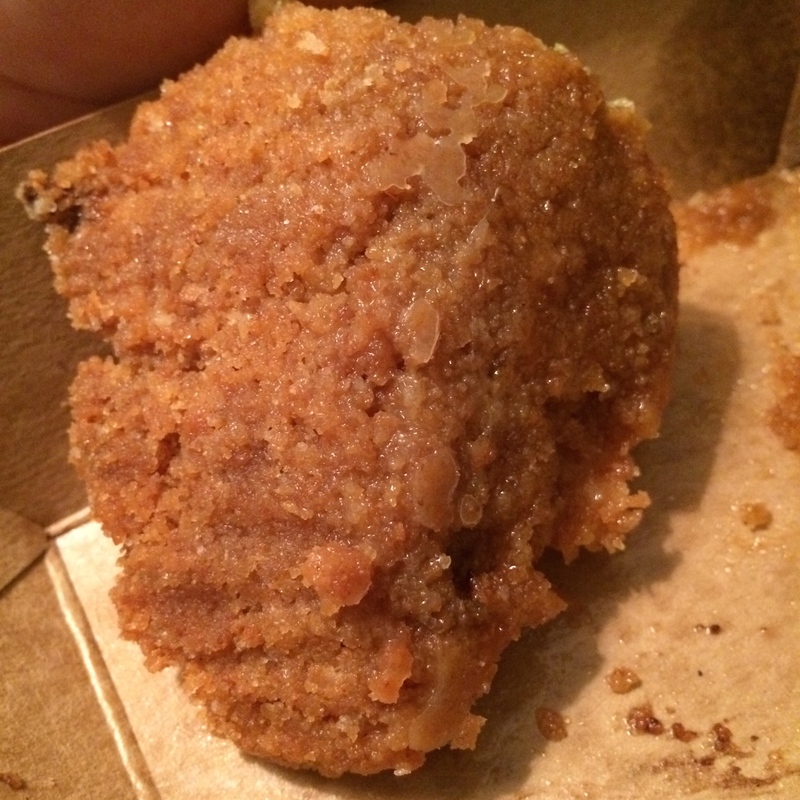 It was hard to not eat the thing in 4 bites and be sad that there wasn’t more. It lived up to the precedent set by it’s apple brother and put a smile on my face. But hey, let’s talk about the dough, shall we? You can make as much pie filling as you want but if the shell tastes cardboard like or is incased in sugar to hide the chemicals, no one will buy it (I’m looking at you, Hostess fruit pies). thankfully, these pies have amazing crusts! Both buttery and flakey, plus chewy and dense, this crust wins a prize from me for being amazing. My cardiologist would like to have a word with you, I’m sure. And now to talk about the headliners, the pie. 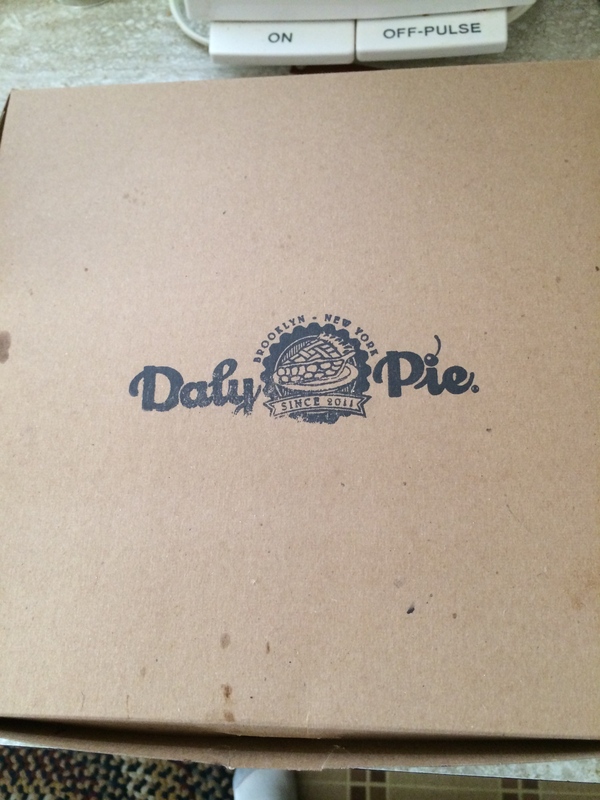 THE PIE. GOOD GOD, THE PIE. Sorry. Had to get that out. The pie, if you haven’t guessed, is pretty awesome. Let’s go to it. 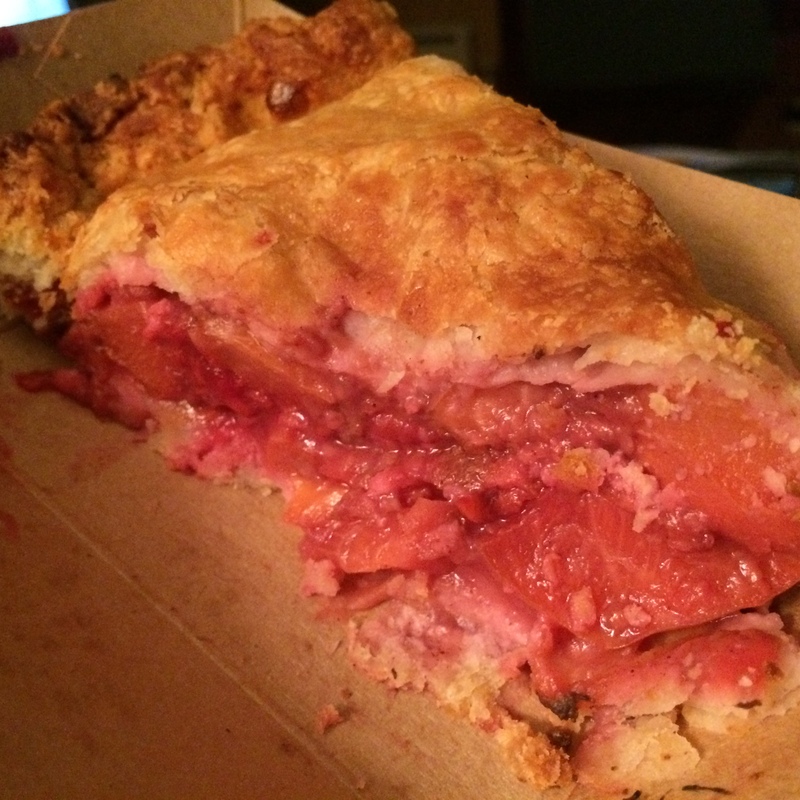 First off is the Raspberry Peach pie. Most of the time, if you get a peach pie, the peaches are kind of mushy. I also am not a huge fan of raspberries because I can’t stand the seeds. I gotta say, this pie converted me. The peaches were al dente, so you actually felt like there were some things going on in there, 2 types of fruit (and the peach pieces were large). Not just a slurry of something vaguely fruit-like. The pie had a perfect balance of sweet and tart, and it had just a hint of floralness, which was surprising to me, but even more surprising, I loved it! The crust was both buttery and flaky, I could have eaten just the crust and been happy. I normally don’t eat the outside edge of the pie, because a lot of times it’s rock hard or overdone. This was neither of those things, this was dense in a beautiful buttery taste. It was downright great. The next piece of pie I had was the Salty Lime. When I heard the name, I wasn’t sure what to expect, because at first glance, the pie just looks like a piece of cheesecake. If you licked the edge of a margarita glass and then ate a piece of cheesecake, this is what that tastes like. First the salt hits your tongue and the lime follows right up with a 1-2 punch. Woven in the cheesecake like texture are teeny bits and pieces of lime, giving it a secondary texture that really bumps it up a notch. I was surprised at how much I really enjoyed it! 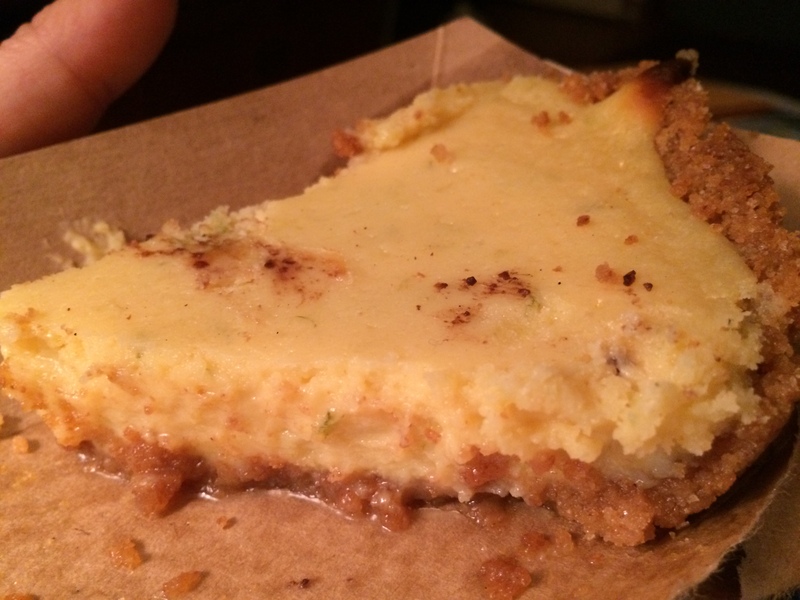 The crust is a buttery graham cracker crust that, again, I could have eaten all by itself! I can’t wait to get my hands on more of that salty, tart, buttery goodness! (please don’t mind the chocolate on the top in the picture. That’s not usual, some of my Chocolate Guinness Pie got on it as I was moving things around). Graham cracker crust! Looook at it!! Speaking of Chocolate Guinness Pie, why don’t we? Think of the moistest, chewiest, cakiest brownie you ever had. Then add Guinness. Then add hand made caramel on the top. Then add a nap, because that’s what you’ll need after this monster. I’ve never had Guinness in really anything else besides my glass before, so I was intrigued by this. Would the Guinness just take a stroll thru the pie, or would you actually taste it? Good news! You can most absolutely taste it. The only way I can describe it is if you ate some amazing chocolate cake and then took a big sip of a guinness right at the same time. He beer steps right on out and says a hearty “Hello!” before melding itself into the heart of the pie. The caramel on top is like the big arms of a mom bringing thier 2 kids together in a beach towel, just with more sugar. I can’t say enough about this, and usually I do not care for a super heavy pie like this. It won me over again and again with each bite. Unfortunately, I do not have a picture because I took it so fast before I ate and by the time I checked it, the pie was, well, gone. So it’s a bunch of thumbs up for Daly Pie and Meghan and Michael! I’m hoping they come back down to Philly more often and if you live in NYC, check out thier website and catch thier amazing pies! They make a ton and they are all on the site. You can order in advance or you can come see them and try whatever they decide to bring. They also make gluten free pies!